The history of baseball is the history of the business of baseball. Since the first group of ball players tried to figure out how to pay for a bat or ball until the latest free agent signing, little has happened inside the lines that was not deeply affected by goings on outside the lines. For that reason, much of the research on the business of baseball is just plain, old-fashioned baseball research using the same resources. This chapter will focus more narrowly on economics, the legal environment and management of the game. Outside the Lines is the newsletter of SABR’s Business of Baseball Committee. From 1995 through original committee chair Doug Pappas’ untimely death in 2004, the newsletter was a fairly personal organ through which Pappas, a widely respected authority on the business of baseball, published research and commentary. Pappas also routinely surveyed committee members on business of baseball matters, including needed research. Since 2005, the newsletter has published research on a broad range of baseball topics. Newsletter archives can be found here, on the Business of Baseball committee page. Street & Smith’s Sports Business Journal has covered news on sports business broadly since 1998. It publishes 49 times a year. It is aimed at “Business Executives Across the Sports Industry”. Its sister electronic publication, Street & Smith’s Sports Business Daily, provides a daily “executive update service”. Both publications are subscription only. Sports Business News is a subscription-only electronic journal published by Howard Bloom. It covers sports business broadly, including baseball. A good starting point for the study of the business of baseball is the website of SABR’s Business of Baseball Committee at http://research.sabr.org/business. There you will find a collection of documents, including the collective bargaining agreements between Major League Baseball (MLB) and the Major League Baseball Players Association (MLBPA) and the published House Judiciary Subcommittee on Study of Monopoly Power 1952 hearings, chaired by Rep. Emmanuel Celler on antitrust matters in organized baseball. Rodney Fort’s Web Pages: Fort, a Professor of Sports Management at the University of Michigan writes on the economics of sports. His website has the best collection of data compilations on economic aspects of baseball. BizofBaseball.com bills itself as “… the first all inclusive location for news, interviews, data, and articles dedicated to just the game of baseball and the business that drives it.” It has especially useful databases on arbitration. Baseball America Business Blog: Since May 2007, this blog has tracked both major and minor league business issues. Field of Schemes: This blog, authored by Neil Demause, co-author of Field of Schemes: How the Great Stadium Swindle Turns Public Money Into Private Profit (1999), covers ballpark and stadium siting, construction and financing issues. Sabernomics: This blog, penned by J.C. Bradbury, author of The Baseball Economist: The Real Game Exposed (March 2007), covers broadly baseball economics with a special focus on the economics of trades. Sports Business Digest: This blog, authored by Emmett Jones, provides opinions and some news on the business of sports. Baseball is not its main focus. Sports Economist: This multi-author blog “…is intended to be a depository of economic thinking on issues in sport, and to a lesser extent, economics in general.” Covers all sports. The authors are all professional economists at institutions of higher education. Sports Law Blog: This blog, authored by four professors of sports law, focuses on the legal issue related to sports. Tim Lemke's Blog: Tim Lemke covers the business of sports for The Washington Times. Baseball Prospectus: Although thought of as a statistics and fantasy site, Baseball Prospectus frequently publishes on the business of baseball and has since its beginning in 1996. This site has recently been publishing some of the important work on the economic value of players and player performance in the context of likelihood of making the playoffs with its MORP, Marginal Value Above Replacement Player, developed by Nate Silver. The Hardball Times: The Hardball Times regularly features articles by Brian Borowski and others on the business of baseball. Baseball has a long history of litigation, especially around issues of antitrust. Legal scholars typically have access to services such as Westlaw or Lexis/Nexis. Most important decisions, however, can be found without charge on Findlaw, for example, the landmark Supreme Court decision in Flood v. Kuhn (407 U.S. 258 (1972). Briefs are often more useful to the researcher than the orders themselves. Current cases and the briefs submitted are provided by the American Bar Association’s Preview site. The Supreme Court has published a guide to finding briefs, although electronic access is only recent. However, repositories of printed briefs are listed as well. Baseball has repeatedly drawn the attention of the United States Congress. For example, in 2008, the House Oversight and Government Reform Committee held hearings on Steroids in Major League Baseball and the Mitchell Report. To locate testimony given at recent hearings, you can go to the committee website for the House of Representatives or the Senate, and go to its list of Hearings. Then, you find them by date or topic. The Government Printing Office also provides online access to some hearings and committee reports since 1995. Prior to that, you should check your local Federal Depository Library to see if they have the committee report you seek in the Congressional Serial Set. A massive catalog of baseball-related publications is SABR’s The Baseball Index, a searchable database. A recent search on “salaries", for example, returned 3,752 entries going back to 1870. 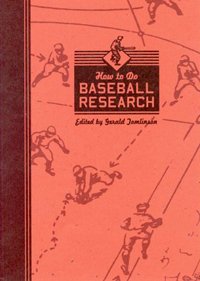 Steve Weingarden has compiled a listing of the academic literature on a variety of subjects in the SABR Business of Baseball Scholarly Work Collection (not working as of December 22, 2009). Weingarden has described the sources and his approach in SABR Business of Baseball Scholarly Work Collection. The SABR Business of Baseball Committee website also contains a modest bibliography of books on the business of baseball. Rodney Fort, a Professor of Sports Management at the University of Michigan, writes on the economics of sports. His website has the best collection of data compilations on economic aspects of baseball and should be the first stop in looking for economic data on baseball. Although increasingly dated, the late Doug Pappas’ collection was the model for much of what has followed. His site, now maintained on SABR’s website, includes team-by-team payroll information, 1977-2004, ticket prices and Fan Cost Index by team, 1991-2004, ticket prices by team, 1950-2004, team profits and selected payrolls, 1920-50 (Excel spreadsheet), and a do-it-yourself player salary database, 1985-2004. A local broadcaster database, and Financial World and Forbes annual team-by-team revenue and profit estimates, 1990-2003. The best evidence on modern player compensation is data shared with the MLBPA as part of the Collective Bargaining Agreement (CBA). That information, however, is only distributed to a limited list of persons who must sign a confidentiality agreement. See the current CBA. The USA Today Player Salary Database reports on all players from 1988 to the present. “Deferred payments and incentive clauses are not included.” Professor Fort has compiled various estimates and data on player salaries for earlier years. Less convenient, although more comprehensive, is the collection of player contract cards at the National Baseball Hall of Fame and Museum which “…which trace the contractual history of almost every player who ever signed a professional baseball contract from 1900 to today.” The contract cards cover both major and minor league players. Because baseball clubs are almost exclusively privately owned entities, publicly available financial data on those clubs is rare. The Cleveland Indians made public offerings which required them to file financial disclosures with the Securities and Exchange Commission from 1998 to 2000. Michael Haupert, of the Department of Economics, University of Wisconsin–La Crosse, has made extensive use of the financial records of the New Yankees from 1914-1943 held at the Baseball Hall of Fame and Museum’s Research Center. He discusses that data set in “Purchasing Pennants: The New York Yankees Then and Now Part 1: Yankee Revenues and Expenses,” Outside the Lines (Summer 2005). Fort has provided the publicly available data on income and expenses for a scattering of clubs and years. Baseball-Reference.com provides attendance figures for franchises. Forbes has annually since 1998 estimated the value of major league franchises. From 1990 through 1997, the now-defunct Financial World published similar estimates. Fort's website includes summaries of those estimates to date. Fort also provides publicly reported sale prices for franchises going back to 1887. An important source of information on costs and profitability is The Report of the Independent Members of the Commissioner’s Blue Ribbon Panel on Baseball Economics (July 2000). That was followed by testimony before Congress in 2001 with unaudited financial data presented. The most comprehensive reference covering both major and minor leagues (and independent leagues in more recent years) is the Baseball Blue Book, published from 1910 through 1951 as Heilbroner’s Official Blue Book and, after 1952, as the Baseball Blue Book. More recently, it is titled as the Baseball Bluebook. The Blue Book is the comprehensive reference for administrative personnel.